With all that we know about how students learn, the nature of the world they will face after graduation, and the education inequities that have existed for centuries, maintaining a traditional, one-size-fits-all approach to teaching and learning is tantamount to instructional malpractice. International security, the success of global economies, and sustainability as a global society all depend on the success of our education system in the years to come. It's our obligation to prepare our students for their future—not our past. Authors Eric C. Sheninger and Thomas C. Murray outline eight keys—each a piece of a puzzle for transforming the K–12 education system of teaching and learning—to intentionally design tomorrow's schools so that today's learners are prepared for success . . . and stand ready to create new industries, find new cures, and solve world problems. The authors encourage you to use the hashtag #LT8Keys to continue the discussion online. "In Learning Transformed, Sheninger and Murray deftly combine the past and the future by offering eight keys to the schools of tomorrow, while lodging their insights into the history of the school reform movement. Read this book to be enlightened—and to put fun, excitement, and real learning back into your school or classroom." "Sheninger and Murray combine some of today's most compelling research, evidence-based practices, and innovative ideas to provide a dynamic blueprint for redefining student learning experiences. They demonstrate how students' participation in authentic, real-world experiences can disrupt inequality and increase access to critical learning opportunities. Learning Transformed serves as a handbook to implement actionable, sustainable change in schools so today's students can thrive in tomorrow's world." "Given how quickly and profoundly the world is changing, there are few more urgent challenges than the transformation of our schools and education systems. Some people are still unconvinced of the need for this transformation: others are unsure how to make it happen. Learning Transformed is addressed to all of them and to every other educator, administrator, and policymaker with a serious concern for the future of our children and our communities. It draws on the best research about the need for change and on the strategies that work and those that don't. More than that, it's seasoned throughout with deep, real-world experience of teaching and learning, policy and practice in innovative schools and pioneering districts across the nation. Learning Transformed is both a compelling manifesto for the schools our children need now and an inspirational blueprint for how to bring them about." "Our team has been immersed in deep learning for five years, and I can say without a doubt that Sheninger and Murray don't miss a trick. Learning Transformed has it all: eight keys that are concise, clear, and comprehensive. Great insights across the whole book. The chapter on learning spaces and design is a gem—an innovative treasure trove of new ideas. The use of successful practitioners at the end of each chapter to bring home the points is especially powerful in consolidating the lessons learned. 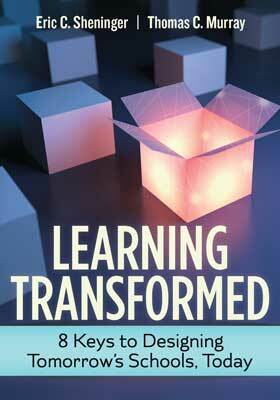 Put Learning Transformed on your short list to read and use!" "What are the needs of the whole child in a digital world? How do you get jobs and joy? Will disruptive educational practices create more opportunity and equity or less? Eric Sheninger and Thomas C. Murray don't shy away from the big questions or shield their readers from the most promising and productive educational strategies either. This book is hopeful but not far-fetched; practical without being pedantic. If you want to approach the future with just the right amount of fear (the kind that prompts you to act with purpose rather than panic)—this is the book for you." "If you are an education leader K–12 seeking detailed guidance on how to modernize your school for today's learner, take a deep dive into Sheninger and Murray's Learning Transformed: 8 Keys to Designing Tomorrow's Schools, Today. Grounded in dynamic examples coupled with engaging design thinking approaches, the authors provide a blueprint for shifting our old schools into new schools." "Eric Sheninger and Tom Murray get to the heart of what matters most when leading change in today's schools. We all know that leadership and school culture, grounded in long-lasting, dynamic relationships, are the clearest path to school improvement. In order to systemically shift K–12 systems, school leaders must model the way and provide the guidance to do this effectively and efficiently. Learning Transformed gives us the research-based evidence and tools to do just that. Eric and Tom are two of the leading innovators in education today and they share their expertise in this excellent book. It is a must read for leaders who are guiding change in their schools." "In working with thousands of schools and districts, Murray and Sheninger have honed a great sense of where education needs to go and how to get there. In response to the challenges of the automation economy—and with equity firmly in view—the authors offer a sensible path forward beginning with a redesigned learning experience so that student agency is the norm, not the exception. Learning Transformed is a must read for education leaders considering what it means to be future ready." "Who do you trust? When it comes to school leadership, look no further than Eric Sheninger and Tom Murray—both professional educators who have devoted their lives to making learning better for students and educators. In Learning Transformed, Sheninger and Murray turn tightly honed concepts into practice. They have a compelling message for us all: 'You are part of the solution.' And with this book, they set out lanterns to light the paths for school leaders who are building vibrant and relevant school experiences for all learners." "At the heart of Learning Transformed is a vision of authentic, high-level learning experiences for all students, particularly for those that are traditionally underserved. Sheninger and Murray provide a dynamic road map for school leaders to fundamentally shift teaching and learning in schools, while keeping all decision making laser focused on the needs of today's modern learners. The decisions of school leaders in the coming years will have an economic impact for generations to come, and this book will help guide them in that process." "Eric Sheninger and Tom Murray knock it out of the park in Learning Transformed. This book will push your thinking and take you the reader through an in-depth comprehensive look at today's schools in order to best prepare our students and school communities for lifelong success. The authors share their eight keys for intentionally designing tomorrow's schools that will leave you wanting more. This is a must buy for all educators!" "Learning Transformed is an essential read for those looking to empower students, staff, and community as they help create a system that changes the world of education. The combination of evidence-based research with actionable steps to get your district moving is a rare find. Murray and Sheninger not only give you the 'why,' they give you the 'how' and feature districts that are creating incredible environments for students and staff. As a practicing administrator, Learning Transformed is definitely the road map to give my students and staff an environment where all can thrive." —Joe Sanfelippo, superintendent, Fall Creek School District, Wis.
"Remodeling schools for a new day requires much more than a single intervention. While many communities seek the silver bullet, Tom Murray and Eric Sheninger make the essential case that transformation is a pervasive and ongoing activity. It requires leadership for a new culture that prompts us to reconsider instruction, time, learning spaces, technology tools, and the various other dimensions that contribute to student learning. Tom and Eric don't mince words on the hard work of school transformation, but the expression of that work is the most cogent, future-focused, and inspirational you will find. These are two great leaders discussing great leadership, and I encourage all principals to join their conversation." "This is the book that educators who want to transform learning with technology need to read. It starts, as do many books about education technology, about the vision and promise of technology—what might be called the 'why.' But Sheninger and Murray go well beyond that and dive deeply to the 'how.' As CEO of CoSN, the professional association of school district technology leaders, this is exactly the sort of practical how-to handbook that educators, especially those who want to be technology innovators, have been looking for. It sparks imagination while giving concrete next steps. There is an old saying that if you want to solve big problems, you have to first stop proving that you can't. This book provides a road map for transforming learning that is ambitious yet also realistic and doable." "While it's trendy for teachers to talk about 'tomorrow's schools,' renowned educators and thought leaders Tom Murray and Eric Sheninger separate the wheat from the chaff in Learning Transformed. Small wins, cultures of innovation, and student agency are just three important points of emphasis the authors underscore in this carefully researched and pragmatically designed blueprint for turning tomorrow's schools into today's learning environments. If you want student-centered learning, modern classroom design, 21st century professional growth, and impactful change at your school, Learning Transformed is the path you must take, and Murray and Sheninger are the perfect guides." "Learning Transformed is based on the premise that everyone in a school community, from students to teachers, administrators to parents, needs to be on a learning journey together. Learning is the heart of the work; active, engaged and collaborative growth must be central. Sheninger and Murray articulately make the case that learning is an ongoing process that starts with adults in a school and district who challenge themselves to grow and learn, modeling this for their communities and then moving that attitude into classrooms and with the students. The authors challenge leadership teams to create environments where others are invited to join in tackling real problems that have significance for individuals and for the community at large. After identifying the challenges facing the education system today, the authors create a clear blueprint for change, with each chapter concluding with real-life scenarios of schools and educators where these new strategies are already in practice. Each chapter, while acknowledging the challenges, clearly shows that change is possible and can be applied and become effective in schools across the country." "Present-day America is in the throes of radical disruption of home, community, political, and economic boundaries wrought by the rise of the Smart Machine Age—a historic turning point. Learning Transformed: 8 Keys to Designing Tomorrow's Schools, Today offers educators practical insights into processes of educational change essential to ensure learners are ready for a future world that will continue to rapidly evolve in decades to come. In their book, Eric and Tom bring significant disruptive forces into focus and rather than just admiring problems faced by educators caught in this turning point, they offer keys to transform schools and learning so that all learners will be #FutureReady." "Murray and Sheninger call for educators to move away from current 'one-size-fits-all' approaches through intentional redesign of school. Their case for shifting instructional paradigms is grounded firmly in practical, action-oriented expertise and recommendations drawn from the authors' own experiences as school and system leaders; a broad and deep base of cited research, frameworks, and tools from other organizations; and Innovative Practices in Action stories told by other administrators across the nation. This book is a rich resource for leaders seeking to bring in new ideas and tools to increase equity, engagement, and effectiveness for today's learners—student and adult—in their schools and districts." Eric C. Sheninger is a senior fellow and thought leader on digital leadership and learning with the International Center for Leadership in Education. Thomas C. Murray serves as the director of innovation for Future Ready Schools, a project of the Alliance for Excellent Education, located in Washington, D.C.